In order to balance the nutrition plan for the children, the day-care center can follow the recommendations of the Bremen Institute for Prevention Research (https://www.bips-institut.de/home.html) and the quality standards of the day care center of the DGE (http://www.fitkid-aktion.de/qualitaetsstandard.html). In the case of kindergartens in which self-cooking is carried out, the food for the older children should be planned in such a way that the pap for the toddler can also be prepared from it. When a kindergarten cooks itself the kindergarten can shape the menu along a week's structure (see Requirements for a balanced diet). If the day care center has a caterer, it is possible to compare the weekly schedule with these recommendations. If a caterer has several meals a day, the management or a responsible educator must ensure that the food is ordered according to the checklist of these specifications. 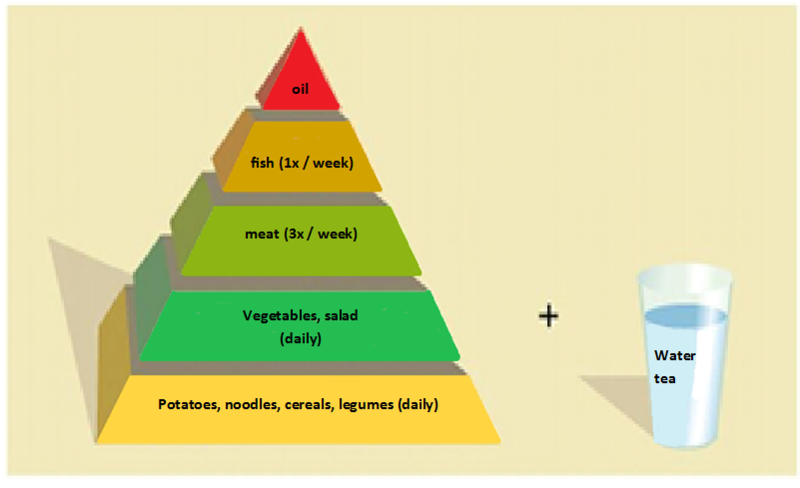 The Optimix concept describes the lunch pyramid for the weekly food scheduling as shown above. It brings the diet plan for the week to the short form: Daily cooked vegetables + natural rice, whole grain noodles or potatoes, 2-3 times a week meat (70 g) and 1-2 times a week fish (70 g).